I had really fantastic responses to our 25 Days of Kindness project! I've contacted some local ministries with varying amounts of luck getting answers. I'm still looking for someone with contacts at a nursing home if anyone in the Memphis/Shelby County area has any ideas for me. I've updated the original post to include some of the newest ideas. I decided that our Elf on the Shelf Jerry is going to deliver our kindness assignments! I wasn't ever way pumped about the elf but after Lainey gave us the book last year, I ended up having a lot of fun with it. I figure that Jerry can show up, do his thing, and bring the little cards that we can then put into our homemade advent calendar. 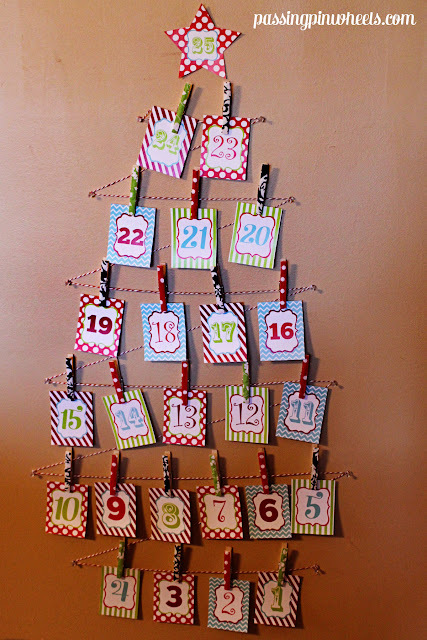 At the end of this post, I'm going to include a link for anyone to download the advent calendar I made! It isn't anything earth-shatteringly amazing but it's free and, I think, pretty cute. I should have put it into a picture frame or something--if I find one I'll do it--but I just used clear thumb tacks to attach the red and white twine to the wall in the playroom! Autumn and I covered clothespins with some scrap fabric with hot glue. For the cards, I made four different backgrounds and used four fun fonts to make the dates 1-24. The 25th is a star that goes at the top of the "tree." The lighting in that corner is really weird so that above photo is kind of terrible but you get the idea. I've taken it all down and all that is hanging on the wall is the twine and the thumb tacks. Beginning December 1, Jerry will bring one date card every morning. On the back, we'll get our kindness assignment. I thought it might be a fun way to make Jerry and Christmas in general a little less about us and a little more about giving to others. If you'd like to download the advent calendar, go to this dropbox link. If there are any issues with the file, contact me. I recommend printing this on white cardstock. If you end up using it, send me a photo! Coming soon: Acts of Kindness cards!